I recently finished a book called Don’t Waste Your Sorrows. It gave me so encouragement, I already passed it on to someone else who needs it. I saw the name of the book somewhere in passing, and was already familiar with the author, so I wanted to get a copy. I was not disappointed, not in the least. If you are a believer going through some kind of difficulty or sickness and you prayed for relief from it but it did not come (yet), this book is for you. Paul F. Billheimer was a ministry leader and founded TBN. He has been with the Lord since the 1980’s. In this book, which is a sequel to the book, Destined for the Throne, he gives us a brand new outlook on the purpose of suffering. God can only create agape love in us through breaking us. Yes, you read that right. God uses (only) broken Christians. Remember He did not come for the healthy but for the sick. I remember coming to a point in my life where I told God that if He could not use a broken vessel than I had better just quit the Christian life. But it is through our difficulties that we seek hard after Him, not when everything is going our way. Billheimer shares that each believer in Christ is appointed their own particular set of sufferings. If we only complain and grumble through them, we have wasted our sorrows, and the chance for God to form agape love in us. If we accept them as from the Lord, it gives us a whole new outlook on life. He says that agape is the “throbbing pulse of the universe.” We won’t need agape when we get to heaven, for there will be no sin there. Now is the time we get the opportunity to share God’s agape love to the lost and dying world. If we allow the trials to form His love within us, it will be the basis of great reward. No matter what we have been handed in life, we have a chance to gain a reward by letting Christ be manifested as we go through confusing and difficult trials. We can still be happy, knowing that God is working them for the good if we love Him. This book (in the original version, the one I read) is a quick read but do read it thoughtfully as there is much there to meditate upon. It could change the direction of your life. OK, I admit to you all that I had a book on my shelf that I bought for my children when homeschooling them. It sat for many years. I am not even sure that any of them read it, but last night, I said to myself that the book had sat long enough neglected. I pulled out my ex-library copy of Paul Gallico’s novella The Snow Goose. I have a vague memory of seeing this as a movie and it haunted me. For some reason, I thought it was a Christmas tale but it isn’t. However, it does convey the spirit of Christmas as the main character gives his life for others. Paul Gallico’s short story was first published in the Saturday Evening Post and then made into a novella. Philip Rhayader is the main character, but he is deformed. His one hand is like a claw and he is hunchbacked. Society shuns him so he lives in a lighthouse all alone, but he has a magic touch with the birds he encounters along the English shoreline. One day a disheveled little girl comes to him with a wounded snow goose in her arms. He is able to nurse the goose back to health, and he and the goose eventually becomes attached to Philip. Though the bird is from Canada, it does not return there, but every winter will fly down to winter with Philip. The little girl, Fritha, comes back every year to see the snow goose. Eventually, a deep friendship grows between Fritha and Philip, even though she recoils because of his deformities at first.Fritha looks beyond the outward and realizes she loves Philip as she grows into a woman. Britain is at war with Germany in the second World War and Philip hears of wounded soldiers trapped at the Battle of Dunkirk. One day Fritha sees Philip getting into his boat. She wants to go with him, but he must go alone across the sea to rescue the wounded soldiers and collect them off the bloody beach. But actually, Philip is not alone, for the snow goose is flying with him. He ends up rescuing hundreds of soldiers. But the Germans attack with their machine guns and Philip is killed. The snow goose protects him whenever someone comes near. The bird becomes like a legend. and anyone who sees him is protected. When the snow goose returns to the lighthouse alone, Fritha knows that Philip is gone. She comes to the lighthouse every day to care for the birds. But, at last, the lighthouse is destroyed by a German bomber. The Snow Goose teaches adolescents, well, all of us, valuable lessons. Fritha looked beyond an apparent handicaps and saw true beauty in Philip as he cared for the creatures, and the soldiers on the beach. The Snow Goose shows us his loyalty by coming back to Philip’s lighthouse year after year, and guarding his body in death. Philip was kind to all, in spite of being an outcast. Good lessons, all, and revealing the wonder of the spirit of giving as exemplified when God became a tiny baby for our sakes. Today I review an oldie but a goodie, a Happy Day Book by Standard Publishing called Baby Jesus ABC Story Book with illustrations by Cecile Lamb. This one I remember sharing with my own three children, who are now grown. 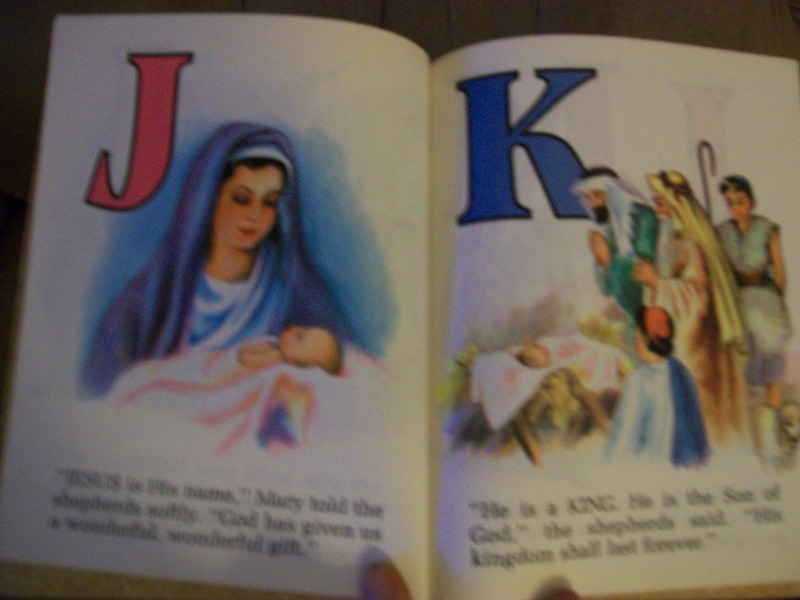 In beautiful full color pictures and sharp text, the Nativity Story is told plainly for little ones. I found this old treasure at a yard sale, it is copyrighted 1979. I read it over and over not so many years ago, and now with two little grandsons coming, I will be sure to read it again to them. The window of opportunity to teach our children is so short. In the book of Deuteronomy, the Israelites were told, “And these words that I command you today shall be on your heart. You shall teach them diligently to your children, and shall talk of them when you sit in the house, and when you walk by the way, and when you lie down, and when you rise. You shall bind them as a sign on your hand, and they shall be as frontlets between your eyes. You shall write them on the doorposts of your house and on your gates.” (Deuteronomy 6: 6-9) If this was true for them in the age when there were no distractions from technology and the media, how much more is it important today? Children will be accosted with many worldly ideas all too soon, it is never too early to tell them of the God who loves them, who sent His Son to die for us all on the cross. Dare I say that teaching the Bible is more important than promising them presents from Santa? They will one day find out Santa is not real, but the Incarnation is a fact of human history. It actually divided it, even if some try to change A.D. to the C. E. (Common Era). Sometimes I find the old fashioned books spell things out more clearly, because back then (in the late 70’s even!) people weren’t worried then about being politically correct. This book starts with the story of the angel (A) bringing news to Mary about a baby (B). It goes on to talk of camels (C) and donkeys (D), and the baby coming to earth (E). I think you get the idea. Nothing added to make Christmas a fairy tale. No, just the real, incredible fact that God reached down to us in the form of a human baby to become Immanuel, GOD WITH US!